One of our favorite things about spring in Philadelphia is the return of outdoor festivals. Every weekend you can find a festival for you, whether its an arts festival, a food festival, a music festival, a neighborhood festival or something else. Below find the top festivals that we are looking forward to this spring! Although this doesn't even scratch the surface of all the fun outdoor spring activities that Philly has to offer, there’s plenty here to help you get started with planning your spring. So what are you waiting for? Get out there! Get outside to enjoy the festival fun and share your photos with us on Twitter, Facebook and Instagram @Phillyfunguide! Don't miss the Philadelphia Film Society's mid-year film festival; PFF SpringFest brings the best and brightest from the international festival circuit to Philly! From April 12-April 14, experience the Philadelphia premieres of dozens of films both domestic and international before they blow up. 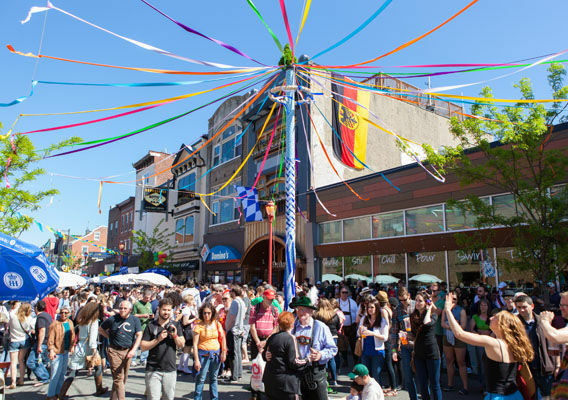 Sample all that Manayunk has to offer with the annual StreAT Food Festival! On Sunday, April 14, neighborhood businesses and local vendors will line Main Street for an afternoon of festival fun. As the name entails, there will be plenty of food to go around; over 50 of Philly's best food trucks and food vendors will be selling their specialties, including dishes highlighting strawberries, the featured spring ingredient. Alongside the food, familarize yourself with neighborhood businesses and enjoy live music. Celebrate Super Bowl LII Champion Howie Roseman at the 7th annual Philly Showcase of Wine, Cheese & Beer! On Friday, April 12, at the Philadelphia Convention Center, guests will gather to celebrate the athletic achievements of Howie Roseman, as well as sample the best that the city has to offer in wines, beers, cheeses and other local delicacies. Proceeds from the event support the Boys and Girls Clubs of Philadelphia. Enjoy a night of live music and fine art while also supporting the Philadelphia Museum of Art at the Philadelphia Antiques and Art Show! From April 26-April 28, guests can mingle with dealers, participate in a silent auction and much more. Look below for even more festival fun!